A meditation on the illusion of filmmaking, inspired by the spirit photographs of the Victorian era where the presence of ghosts and spiritual entities were fabricated using double exposure and chemical processing techniques. The installation consists of a double projection of a sequence shot in a green-screen studio, in which historical characters (played by actors) are performing the staged appearance of the excretion of ectoplasm. 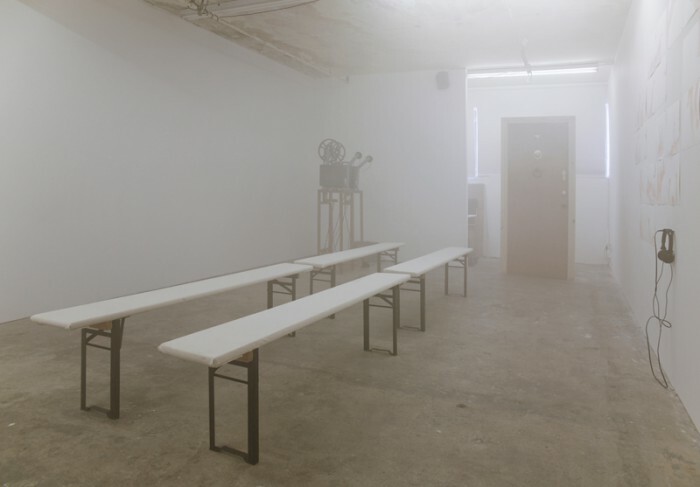 Within the installation, the two lengths of film are housed within a loop machine; the looping mechanism of the projector repeats the choreographed scenes, and over time the narrative connection between the two characters oscillates.